Ian Reid (Nusi) is a Heiltsuk artist whose work I have been watching for a while. For a long time, I was determined that the first Reid piece that I would buy would be one of his Chilkat ravens, like the one that was in the Continuum show at the Bill Reid Gallery. However, when “Working Shaman” came into the Inuit Gallery last month, I leaped at the chance to buy it. The mask is a simple one in some aspects, but all the more appealing for that reason. If you have read anything about shamanism on the Northwest Coast, you may remember that shamans typically did not wash or cut their hair. This is the main element in Reid’s mask, with its unkempt hair and mustache, its carelessly-tied topknot, and the white feathers. The blending of the red paint into the color of the unpainted wood also suggests a lack of cleanliness, or at least the chapped complexion of someone who spends most of his time outdoors. Many shamans had a fearsome reputation (certainly, their graves were isolated, and not places where people lingered). This reputation is played upon in many modern renderings of shamans, but Reid has taken a different approach. His shaman is not so much a figure of fear as an eccentric. The unfocused eyes and slightly parted lips suggest the trance state of someone imperfectly grounded in the everyday world. This is the first Heiltsuk piece I have bought, and I admit to knowing almost nothing of the Heiltsuk artistic traditions, mainly because they do not seem to have been studied in their own right. 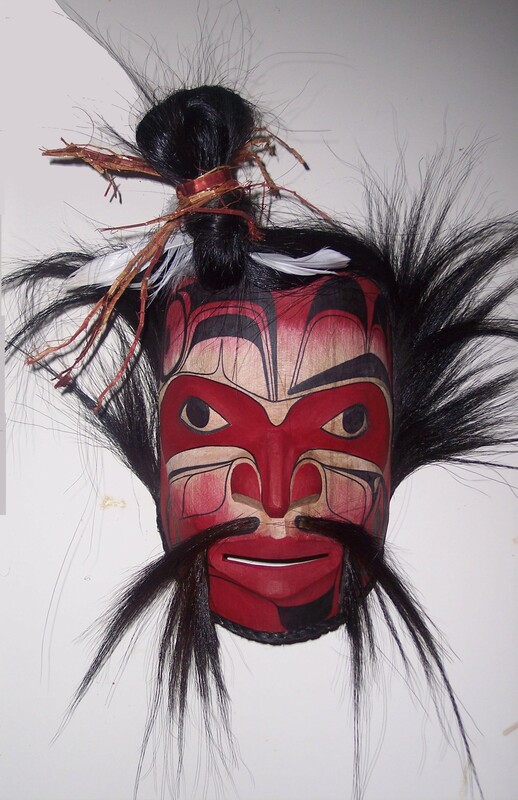 However, the carving and the painting suggest a tradition that I would expect from the Heiltsuk’s physical location: It mostly resembles the Kwakwaka’wakw, but also has a touch of northern formline as well. Saying more is complicated by the fact that Reid seems to be drawing on 19th century sensibilities, rather than working as a modern artist familiar with the formal rules of formline. The formline on the mask is looser than modern artists usually draw today, and the U-shapes are independent decorations, not elements contained by the formline. In fact, such formline as appears is thin and almost overwhelmed by the red of the eye sockets and nose, and around the mouth. Where you can see the plain wood, it looks old rather than recently carved. Add the smearing of the red, and the general impression is of an old mask – dug up, perhaps, from a shaman’s grave to put on display in a museum. Given that much of Reid’s work is ceremonial and communal, this impression is probably deliberate. Artists who work both commercially and cultural generally make a distinction between the two types of work and, looking for a tradition for non-cultural work, what better place to find it than in a museum? That this is a mask to look at, not to be danced, is emphasized by the fact that not only are there no eye holes, but neither are there are any holes for the nostrils — not even an indication of where they would be. Portrait masks can be hard to do well. Many carvers – and buyers – prefer bird or animal masks, that seem more imaginative. But in depicting a shaman and giving the mask a patina of historicity, in “Working Shaman,” Reid shows that a portrait mask can be as imaginative as any. Thank you for sharing your art works. I wonder, by now, how much space is left on your walls with so many masks? There are some young carvers with great talents and Ian Reid is one of them. I also appreciate works from John Wilson which you featured in you blog already. I am also pleased that you have resumed your interest and enthusiasm for the northwest coast native art following you great loss. Keep it up!!! Good day to you, thank you for the great reviews and your comments. I’m very proud of this piece and agree with you that it has great character. It really shows what is in my spirit, and I feel it validates the energy I work with to create my art. For it is the greater idea that works through my mind, and in turn, my hands. I feel that the creations that come from me contain the cosmos and the energy of this greater idea that has always been here since our first generation stories. This is shown in “Working Shaman” who is using that same energy of the world to heal the sick. Thank you again for sharing your comments.